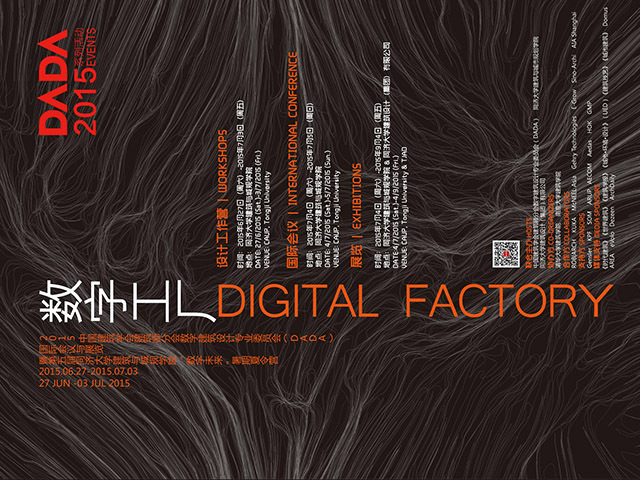 ICD Research Associates Abel Groenewolt and Oliver David Krieg will teach a workshop about robotically assisted timber construction together with Jian Huang (China Academy of Art) for the DADA 2015 Digital Factory Conference at CAUP, Tongji University, Shanghai, from 27.06.2015 until 05.07.2015. The workshop will explore digital fabrication concepts that allow the assembly of complex free-form surfaces without relying on elaborate measuring techniques or geometric specificity of the individual building parts. Instead, by using an industrial robot as an assembly assistant, simple, regularly shaped objects can be accurately placed at any desired location. In effect, by encoding the geometric specificity in the assembly process instead of in the material, elaborate timber structures can be built out of standard and widely available building materials. By working on the design and construction of a large scale, double curved timber wall element, the workshop participants gain experience working with an integrative computational workflow that covers all steps from design to fabrication. Apart from modeling and scripting, this process includes generating data for CNC milling and hands-on experience with robotically assisted assembly.